True glamour, as any Hollywood starlet will tell you, is the chief by-product of one and one thing only: damn good lighting. It’s all about choreographing the light, crisscrossing a fallen shadow with a well-placed halo and you can move from quotidian to timeless in the blink of an eye. Take, for example, the elegant new Harry & Eddie’s restaurant in downtown Hinsdale, which occupies the space once reserved for Hinsdale’s iconic downtown movie theater. It’s a pantheon of great lighting. Large wooden slats on the ceiling shunt down beams of light like they were the roving spotlights from 20th Century Fox’s famous logo. Tiny 1950s-style lamps cast a soft glow over the cozy booths in the back. And the color scheme is pure blueberries and cream—clean slabs of Carrera marble balanced against midnight blue cushions. This place gleams in the sunlight and glows come nightfall as if it were lit by an Academy-award-winning Hollywood technician. Thankfully, all the restaurant’s homages to Hollywood are subtle without being kitschy. Empty old film reels sit on clean counters. TCM fans will notice portraits of Bette Davis and Audrey Hepburn batting eyelashes at them from the bar. And then there’s the central placement of the house piano—which gets a workout from neighborhood musicians every Thursday through Saturday—and feels like a half wink to Rick’s Place in Casablanca. Although the space is named after two prominent architects in Hinsdale in the 1920s—Harold Zook and Edwin Clark—the menu is pure Brian Goeway, who’s best known for his Italian-flavored Gia Mia pizza parlors and Livia restaurants. His menu here stays somewhat Italian but deals up more classic Americana dishes, as he modernizes dishes that would have delighted the old Tinseltown stars of yore. By all means, order the Oysters Rockefeller and fried calamari, but none of Goeway’s apps have the grandeur of the house’s beef carpaccio, which arrives on a plate as big as the hubcaps from an old Studebaker. The meat is cut razor thin—like they do it at Harry’s bar in Venice—and gets latticed with an aioli and topped with curls of Parmesan, fennel, and capers. It’s as spreadable as nduja with a briny acidity that slices through the sharpness of its Asiago flatbread accompaniment. For all this talk of glitz and glamour, the menu has been built, in equal measures, for those seeking an elegant dinner as well as those more casual diners looking for lighter snacks, salads, and sandwiches. 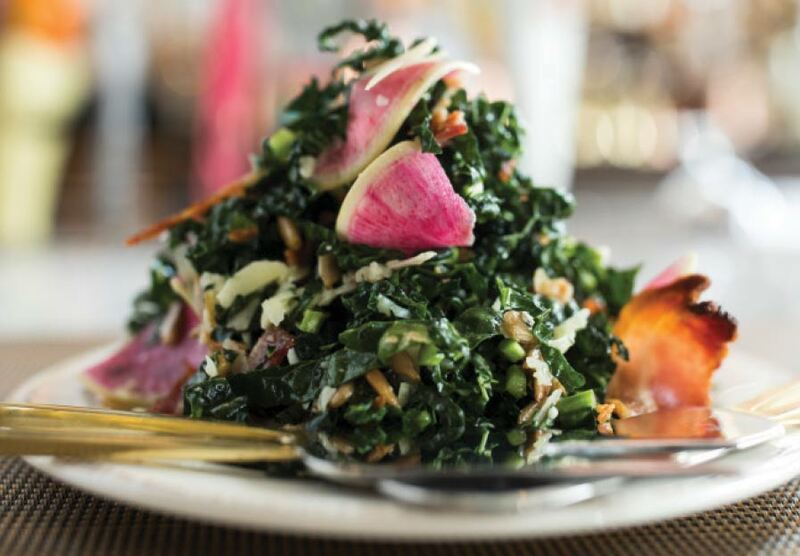 Salads abound—try the impressive yet inexpensive kale offering with manchego and lemon vinaigrette—with entrée -sized offerings running the gamut from steak Caesars and Thai steak bowls to hearty Cobb and blackened salmon salads. 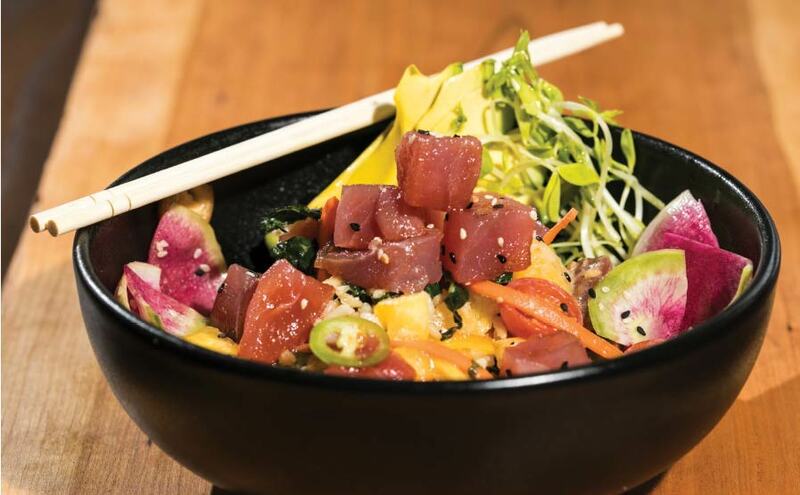 Occasionally, the menu veers toward unconventional offerings, including a decidedly spicy take on tuna poke glazed in a jalapeno jus and topped with bright radishes and frilly curls of fried onion—a mix that’s assuredly un-Hawaiian but decidedly bold nonetheless. The menu’s Italian soul re-emerges on the entrée list, which boasts interesting plays on overlooked classics. The roasted chicken thighs—crisped up with a skin to rival Colonel Sanders’ best—come in a gentle wine broth that’s similar to a deboned chicken Vesuvio. Truth is, it fits the spirit of the place. It’s a quickly disappearing old-school Chicago favorite, which has been pining to make its triumphant return with as much fervor as Norma Desmond on Sunset Boulevard. The pan-roasted grouper, set in a brothy smoked tomato and lobster jus, is pure rustic Italian. Flaky and fresh with a moat of Tuscan-style cannellini beans, it’s both filling and light, a value play that tastes like summer but has the heft of a late autumn dish. 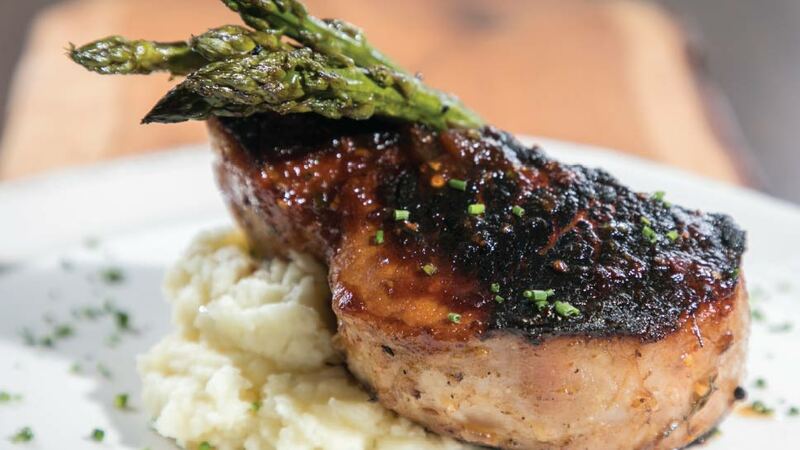 And yet, some of the simplest American combinations work best of all, including a hulking double-cut pork chop glazed in a hoisin. Following that backyard classic with a slice of Key lime pie is a can’t-miss proposition, but the real find in the dessert list is the appropriately named “peanut butter pie in a jar” offering. 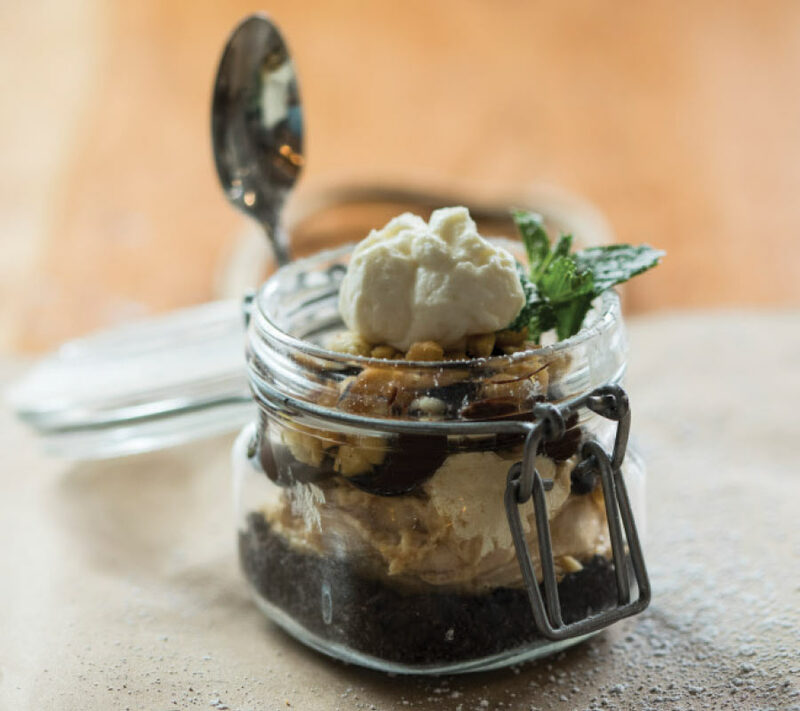 There’s no need to be bashful about digging into that treat, which piles up trifle-like layers of Oreo cookies, peanut butter, mascarpone, and chocolate in glass mason jar. You can go ahead and get a little messy, knowing full well that Harry & Eddie has got your close-up artfully covered. Harry & Eddies is located at 29 E. 1st Street in Hinsdale, 630-590-9047, harryandeddies.com. It has been my pleasure and opportunity to enjoy Chef Goewey’s talents for the last few years. We have followed him EVERYWHERE at each new venture he’s started. Harry and Eddies is truly a gift to Hinsdale. We feel fortunate to live close and stop in just for a drink at the perfect bar. Congratulations to the team. Job well done!